I took this picture of Pie while riding. I stuck my cell out to the side to take it. You can tell it is from a few days ago because there is sunshine and a shadow in the photo. We don't have sun or shadows here anymore. We have rain. 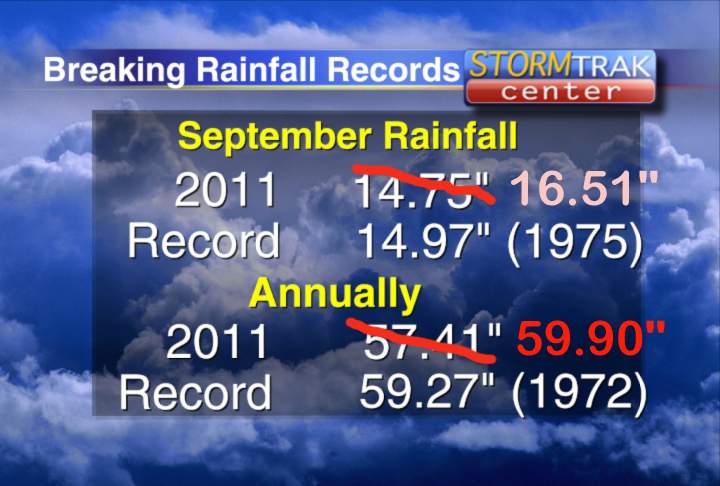 In fact, yesterday we beat the all time record rainfall in our area for September and for the year. Here is a graphic, below, from our local television station. People from around here know that the significance of the 1972 record is from Hurricane Agnes. 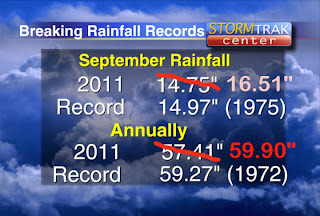 Unfortunately, this year we had more rain than that year owing to our wet May and our recent tangle with Tropical Storm Lee. I have had the boys in the barn for the downpours to save my precious pastures. On good days I tell myself that our pastures don't look too bad considering that this is a record rainfall year. Our bad days, I cry looking at all the mud and bare spots and squishy sheds and the loss of grass for my horses. Yesterday morning I found a secret two hour window without rain and I rode Pie. He was very UP. I stayed on, but it could have gone either way at any moment. Our temperature was hot and humid, but the impending storm/flash flood that hit around 11 a.m. must have been in the air. Pie is a sensitive horse to weather changes. I wanted to ride him to give him a break from being inside. The brothers don't seem to mind being in the barn - in fact I think they enjoy it! Pie doesn't. He likes the fresh air and pastures. He was quiet to groom and tack up, but right from the beginning he did his nervous high speed lip flipping. I made sure to keep him moving forward in an extended walk. I hoped to use up some of his energy this way, but also if I keep Pie moving out it prevents him from going up. The only way I can describe how he feels is like I am sitting on a very large spring. This is the giant, powerful horse you would want under you if you were entering a ring full of high fences. This is not what you want under you to have a leisurely ride around a farm. I trotted him as much as I could given the squishy, slippery footing. The whole ride was dicey and not actually tough enough to do much for his extra energy, but I had a blast. There is something so rewarding about working with a horse to stay safe. I use the word "with" quite literally because Pie gave me so much yesterday. It wasn't easy for him to listen and yet he did over and over throughout our ride. There are many times on a twisty-turny ride through the woods and fields that he has to follow my lead and my leg and my directions. Pie explains in no uncertain terms that he wants to disobey. He throws his head and flips his lips to tell me that he is nervous and doesn't want to go in THAT direction. There is nothing preventing him from going in that direction - no scary monsters. He is defiant inside his own body, in his own skin. His behavior is so like Maizie when she was little (and sometimes now!) at bedtime when she is tired but doesn't want to go to bed. We call that "out of bounds" or "ginchy" because the horse or child is not willing to move forward so they sort of implode. Pie was truly a hero yesterday. He held it together and kept me safe. Never once did he give a relaxed snort or release his neck on his own. I could achieve a lovely extended walk and he lowered his head for me and I am sure he looked beautiful, but it wasn't a truly relaxed lowering. It was the walk you would want if you were being judged, but it was a lie. He wasn't relaxed at all. That is why I am so proud of him. 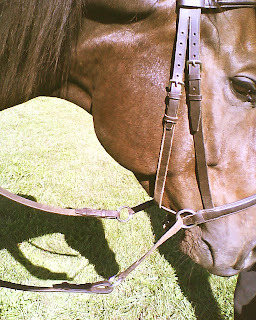 The deception of the ride was crystal clear when we got back in the barn and I started to untack the big boy. He pushed his head this way and that, avoiding the halter in a silly, impish manner. Usually, Pie stands statue-still for untacking and post-ride brushing. I carefully led him out to his beloved apple tree for grazing just as the raindrops started to fall. I thanked him for the ride and promised him better days soon. That's a lot of water. Hope your ponies are getting outside now. Sounds just like my OTTB Steady, the riding a spring, lip flipping, that lovely super forward swingy walk with NO relaxation. But safe and I love him for it. Pie~Pie boy and the impending storms...he is your 1,000lb "Horse trak center"..who needs the news for knowing! Good working "with". Yes, I totally agree, there IS a certain amount of inward glee when one can strive for the attentions of these equines while at thier mercy. They give us mercy! that is a whole heck-of-a-lot of moisture! Wee too at my stable have begun pature saving tecniques. I hear ya. I have NEVER seen so much water!! I think that rain is here in Maine now. I love your description of riding a spring--I know that feeling well! Instead of lip-flapping when he's upset, Harley grinds his teeth. Maybe with the new bitless bridle, he'll relax with nothing in his mouth. Good for you for riding him under the slippery conditions (always a challenge when they're being UP). I wrote an answer in my comments. It seems to be something about the settings for comments. The "embedded page" , Like yours, seems to be the culprit. If you change to a "POP up " comment window. That fixed it for most of us. Here is something though...me using my phone have no problems ! I'd be a little nervous hacking out with a horse that felt explosive, but you have the magic touch. I have to admit, it sounds like lots of fun too. Hope the rain lets up. I am glad that you and Pie made headway on your ride, or I should say, Pie didn't lose it and get crazy! i wonder if with each time you have an iffy but safe ride, he trusts you more and more. Maybe he doesn't freak out all the way because he knows you would never steer him into danger? That's so nice when you know you have gained the trust of your horse. True success in the world. Emerson would be proud. We've had so much rain here too. Heavy rain that dumps sheets of water over us. Not so great for barrel racing when Lilly's feet can slip out from under her in the wet sand of the ring!